The arrival of Plarchie, the 8-metre giant knitted squid made entirely from plastic bags, came as something of a shock to me. One minute I was wandering the echoey rooms of London’s Natural History Museum pondering what knits might spring from my needles. The next thing I knew I was half-awake buried in a pile of crumpled plarn ends with my needles smoking in my clawlike hands. I had no idea what I’d been up to for the last three days of my life. The Giant Squid lurks at 1000 metres below sea level. Doesn't he? Plarchie was big. He was bigger than big. He was giant. He was made entirely from Sainsbury’s carrier bags and rustled eerily as he walked. But, as his eyes were bulging from the sides of his colossal squid head and he looked out to the sides, he had no idea I was there. I scurried behind a fossil display and observed my handmade horror as he made himself at home. He attempted a tentacled dangle. But found he had to hold on. It was a bit scary. He tried a friendly lap and it was juuuuuuuuust right. He looked so nice and relaxed. All squishy and slimy and supine. I took a deep breath and approached the ten-tentacled terror. After all I was his creator! Shouldn’t I be able to tame the crinkly beast? Softly I approached, attempting the crooning melodious call of the sagacious squid whisperer as I neared him. AAAAAAIIIIIIIIIIEEEEEEEEE! HE SEES ME! RUN FOR THE HILLS! 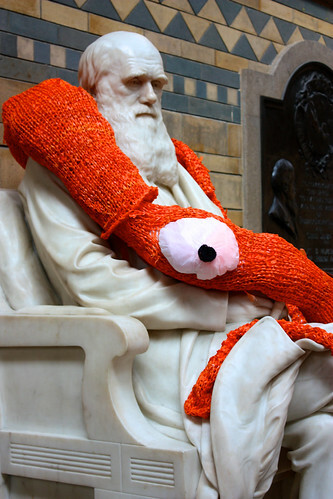 I can confidently report there is nothing quite like being slapped in the face by an 8-metre giant plastic knitted squid to remind you stitched sea life are a dangerous breed. The last I saw of him Plarchie was headed for Heathrow Airport, his tentacles wrapped firmly around the panic-striken driver of a black taxi cab. Heaven knows what will happen as another of my uncontrolled knits is released upon the world. What calamari catastrophes will he bring about? On Ravelry? Visit Plarchie’s project page. Stalking Neil Gaiman? The fabulous Mr Gaiman tweeted Plarchie on February 19. Plarchie now demands his own trailer. Sigh. 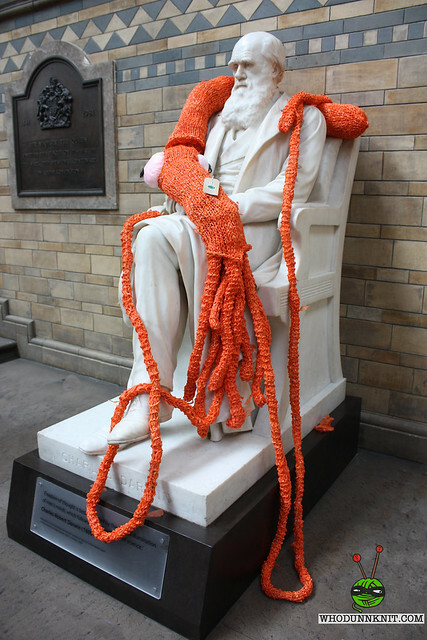 I love giant squid and I love knitting. Plarchie is fabulous. Well done. It looks terrific! Plarchie is awesome and has good taste in literary figures. I’m glad he didn’t actually TASTE said figure. Plarchie is v. handsome. Wish I were there to give him a hug. Omg this is pretty much the best thing EVAR, you are my hero. I wanted to let you know that I mentioned Plarchie in my newest blog entry, thanks so much for sharing it with us! You made Plarchie out of plarn, but filled it with wonder & whimsy 🙂 Congratulations on your creation and the hilarious photos! Long live seafood!! Plarchie Teuthis is astounding. Your fearlessness in bringing him into the world is even more impressive! I only wish I could make one in the States, but our plarn (I like this word!) is usually a dull tan color or a lifeless white. Nothing that would do for a Plarchie. 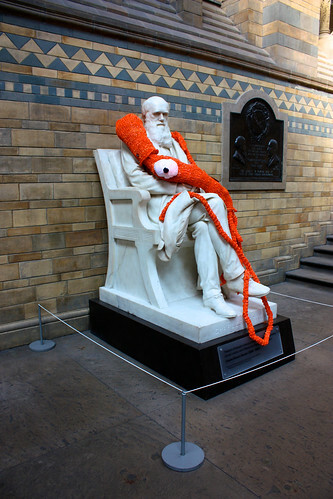 I need a huge knitted squid, and I need it now. 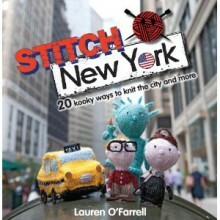 Hey, you’re the caterpillar root graffiti knitter! I loved that. Also loved your Valentine’s one. Did you see ours? Just checked out your Valentine’s efforts – fabulous! Especially loved Eros’ string of hearts! Somewhere floating about in the Pacific is a giant mass of waste plastic. I believe Plarchie has gone to tackle this mess in super squid style. I love him, wish I could have met him! Maybe one day he will return…. He’ll be back and when he does he’ll glad extend a tentacle to you. Then he’ll eat you. Sorry about that. Oooh – this is soo cool! I’m now feeling inspired to do something with the zillions of yards of plarn made from Target bags. oh my goodness, this gave me giggle fits! hilarious, fabulous! well done. This is your mascot? A beer-drinking bloke with one arm, a black nose and a hat?!?! Blimey. Lets hope if the Squid Overlords ever break the surface, they have the same human-friendly sensibilities as Plarchie….